Currently there are 5,363 decks in the EDHREC database running Clone, and not a single one of them should have it as part of the 99. Once again I’m lying. 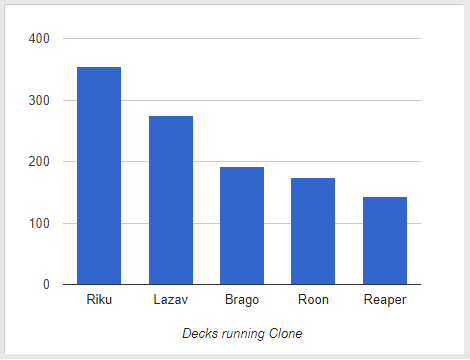 Clone is fine and there are probably decks that want every clone effect possible. There might be one at the end of this article. I think we need to just accept the fact that, moving forward, odds are my first sentence is going to be a lie. At this point with all the dishonesty I’m essentially some cheap bronzer and a rant about birth certificates away from being the 45th President of the United States. Still, just because you can do something doesn’t mean you should, and most people running Clone probably shouldn’t do so. But before we get into why most people probably shouldn’t be running this card we first need to glance at the history of the legends rule, since it is tied fairly tightly to the use of Clone in EDH. Legends were first introduced to Magic appropriately enough during the Legends expansion in 1994. At the time the rule regarding legendary permanents was that if you played one with the same name as a card already on the battlefield the second one (the one you played) was immediately destroyed. If someone had a their Daughter of Autumn as the commander of their prized farmer’s market themed deck on the battlefield, your own Daughter of Autumn would be destroyed upon entering no matter how integral she was to the combo in your own vegan co-op themed deck. If two or more permanents with the same name have the supertype legendary, all are put into their owners’ graveyards. This is called the “legend rule.” If only one of those permanents is legendary, this rule doesn’t apply. In my previously mentioned Daughter of Autumn example now both are destroyed. 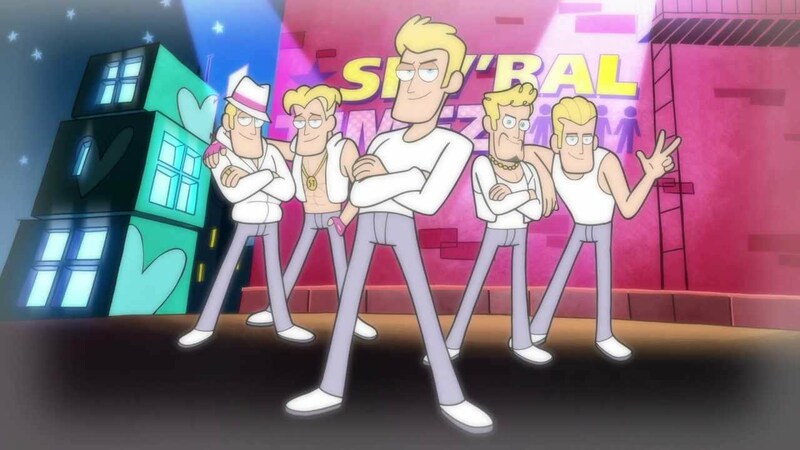 This is where things got interesting for Clone. Prior to rule 420.5e Clone was simply an efficient (or sometimes not) way to get your own copy of the best or most useful creature onto the battlefield. Afterward it became a four-mana kill spell for any legend. And wouldn’t you know it, all commanders are legends. In 2004 commander wasn’t a thing to the point Wizards worried about it for development, but that began to change quickly, and clone variants filled decks as a result. Alas, the golden age of Clone as a kill spell came to a close in July of 2013 when the rule was changed so the legendary check only occurred on a per-player basis. This allowed players to each play their own Daughter of Autumn, but more importantly to the history of Clone, it turned the creature from being a modular kill/copy to spell to being a simple creature copy as originally intended. Gigantoplasm is only found in 1,225 decks in the EDHREC database. That’s a quarter of the lists that contain Clone despite being strictly better in every sense. It has the exact same CMC and the exact same creature type with the exact same ability. The difference? Gigantoplasm also has the activated ability “X: This creature has base power and toughness X/X.” If you never use this ability it is still the same card as Clone, but you have the option to turn your copied Invisible Stalker into a 10/10 beatstick if you have the mana. That is all upside and no downside. Yet Kruphix, God of Horizons, a commander built around keeping mana in your pool allowing an alpha strike with a pumpable creature, has just almost 50 decks in the database running Clone and not using Gigantoplasm. Swapping those two would be an immediate upgrade with no downside. Stunt Double is Clone with flash. There’s just no situation where having the option to copy something at instant speed is worse than not having that, yet Stunt Double shows up in half as many decks as Clone. Ephara, God of the Polis is often built around flash creatures to proc her draw on as many turns as possible, but there are 17 Ephara decks on EDHREC running the non-flash version. Baral, Chief of Compliance builds are frequently designed as control-heavy draw-go decks who want to keep their mana free for counterspells, yet there are 6 Baral decks who would rather cast Clone on their own turn than keep their mana free to flash in a Stunt Double should a counterspell prove unnecessary. Changing Clone to this better variant would be a nice upgrade with no negatives. The copies get slightly less perfect from here on out, but they also tend to come with even more advantages. Clever Impersonator has the same CMC as Clone, though the double blue in the mana cost makes it slightly harder to cast. It has a home in a respectable 14,836 decks on EDHREC, as well it should for a Clone that can also copy artifacts, enchantments and planeswalkers. Still, even among the top five most popular mono-blue commanders there are just short of 100 decks running Clone and not running Clever Impersonator. Playing mono-blue deck renders the double blue casting cost nearly irrelevant making such a choice all the more inexcusable. Phyrexian Metamorph is no secret; it is one of the ten most frequently played blue cards in Commander, full stop. It has a home in 17,569 lists which is 16% of all decks able to run it. That is decent market penetration. Metamorph has the same mana cost as Clone, though you could chose to spend 2 life instead of the single blue if you wish, but it can also copy an artifact. It is also an artifact creature itself, which can be both an advantage and a disadvantage. Regardless, the ability to copy an artifact and cast it for less mana is absurdly useful and explains the card’s ubiquity in blue decks. Still, nothing is perfect; there are multiple blue commanders who care about artifacts as part of their package, and all have decks running Clone but not Phrexian Metamorph including 6 Sydri, Galvanic Genius decks, 13 Sharuum the Hegemon builds and 5 Arcum Dagsson lists. Many of those are clearly not budget builds, either, so the eight dollar price tag probably isn’t the reason it isn’t included in the deck. Vizier of Many Faces sits in 1,271 decks in the EDHREC database. Like Clever Impersonator before it this Amonkhet rare has a double-blue casting cost making it slightly harder to cast than Clone at the same CMC. The upside here is that for 3UU you can exile it from your graveyard to create a white token copy with no casting cost. It’s Clone that can make a token of itself when killed or milled. That’s useful, yet despite coming from the same set there is one Temmet, Vizier of Naktamun deck in the database running Clone instead, and Temmet is a commander who gives his bonus only to tokens. That is inexcusable. Sakashima the Impostor is a clone who retains the ability to be bounced to your hand for 2UU regardless of what she copies. She also retains her name. 2,573 decks are running Sakashima, 174 of which have her as their commander. Insanely enough of those 174 decks, 34 have committed the massive flavor fail of running Clone and not running her own student. And this is in a mono-blue deck where the double blue mana cost is nearly moot. Sakashima’s Student is a clone that is also a ninja. It is currently slotted into 1,429 decks, primarily in Vela the Night-Clad, Sygg, River Cutthroat and Sakashima the Imposter builds. One cool thing about this student is it keeps the ninja type after copying something. Copying Kari Zev, Skyship Raider? You got yourself a Human Pirate Ninja. Etherium-Horn Sorcerer? Artifact Minotaur Wizard Ninja. Anurid Murkdiver? Zombie Frog Beast Ninja. Mistform Ultimus? If you assume this particular student is young you’ve got yourself a Teenage Mutant Ninja Turtle®. The card also has ninjitsu for 1U allowing you to return an unblocked attacker to your hand in exchange, but come on; the real appeal here lies in being able to pretend you’re Master Splinter. Yet against all logic and reason there are 17 Mistforum Ultimus decks running Clone, denying themselves their own Michaelangelo. It’s tragic. Phantasmal Image is a Clone for 2 mana less than the original that comes into play with the caveat that it is an illusion in addition to its other types and that you must sacrifice it when it becomes the target of a spell or ability. That downside sounds worse than it is in reality as most targeting spells in commander are kill spells. The ones that aren’t are generally theft spells, and there’s way worse things than having your creature die when someone tries to steal it. Rite of Replication is a sorcery, not a creature, but it makes a creature token for the same CMC as Clone. The real kicker here is, well, the kicker; for an added five mana upon cast you can create five tokens instead of one. 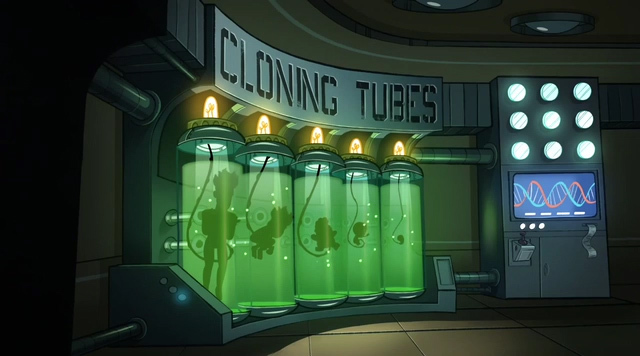 For the downside of your clone being a token you have the upside of it being a able to be copied five times. That can flat-out end games depending on the target, and the card having a home in 18,681 decks reflects this. Melek, Izzet Paragon is a spell-based commander who lets you play with the top card of your library revealed, and lets you cast that card if it is an instant or sorcery and copy it on top of everything. This makes Rite even more powerful in a Melek deck, but there are currently 14 lists in the EDHREC database running Clone and not Rite of Replication. Mizzix of the Izmagnus makes your instant and sorcery spells cost 1 less for each experience counter, and this includes kicker costs potentially rendering the cost of a kicked rite to UU. Even with this bargain-costed blowout potential there are 2 decks in the datebase running Clone over Rite of Replication. The truly bizarre part of this last one? Rite was included in the Mizzex precon and Clone was not. Vesuvan Doppelganger is one of my all-time top five favorite cards, and one of my all-time top five favorite arts from cards as well. That thing is just gorgeous. It is essentially a Clone that can pick a new option each upkeep should you desire, and it itself remains blue. This eliminates the problem of needing a good target, or feelings of regret after having a juicier one come into play after you’ve already cast your clone. Plus did I mention the art is amazing? Vesuvan Shapeshifter is a rather clever workaround of the fact that Vesuvan Doppelganger is on the Reserved List. It has morph, and upon being unmorphed it clones any creatures on the battlefield except that during your upkeep you may turn it face down again, allowing you to again unmorph it to pick a new clone target. Animar, Soul of Elements often lets you cast morphs for zero mana, yet there are 133 decks running Clone instead. Altered Ego has a single colorless mana in the casting cost replaced with a green. With that cost however comes the text that the spell can’t be countered. That alone is probably worth the slightly more complex mana cost in a deck that can run it, but there’s also an unofficial kicker tied to this shapeshifter; you may pay X additional mana when casting Altered Ego and if you do it comes into play with X +1/+1 counters. That’s a decent optional effect for longer games, particularly in a deck that may have a +1/+1 counter theme of some sort. Atraxa, Praetor’s Voice is a commander with an affinity for abusing counters with her proliferate ability, but there are 14 decks on EDHREC running Clone instead. Likewise Vorel of the Hull Clade is designed to double counters on creatures, and 5 decks are using it over Altered Ego. Dack’s Duplicate replaces a colorless with a red in the cost, and gains haste and dethrone in the process. Either would probably be worth the more complicated cost, but adding both is pure value. Evil Twin has a single black mana in place of a colorless and with that comes the ability to tap Evil Twin for UB and destroy a creature with the same name as the one copied. Killing the Elesh Norn, Grand Cenobite you just mimicked seems like a decent upside in decks running black who want a copy creature. There’s a lot of clone effects that don’t step into the exact same slot as perfectly as the ones I’ve listed. Many are found in the deck below, but there are even more that didn’t make the cut. If you’re still running Clone odds are one of these options will work a little better for you, and over time a bunch of a little betters adds up to a lot better. I’d love to hear your perspective on all the clone variables, as well as any suggestions for future cards to cover in the column. Until next time, I’m Dana, and I’ll see you In the Margins. Lazav says we have had cloning in the south for years. Its called cousins.